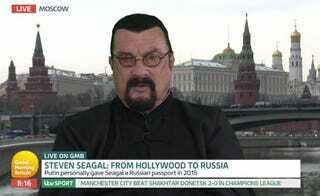 I wonder what would possess a morning television show to resurrect Steven Seagal from his coffin of Mandarin-style suits and Just for Men hair dye, to even ask what he thinks about anything, especially when it concerns the politics behind the recent protests going on in the NFL. Seagal appeared on Good Morning Britain on Wednesday, and of course, like millions of other who still don’t realize the players aren’t protesting the flag or anthem but, rather, the injustices black people face, Seagal went on a faux-patriotism rant. “I believe in free speech, I believe that everyone’s entitled to their own opinion, but I don’t agree that they should hold the United States of America or the world hostage by taking a venue where people are tuning in to watch a football game and imposing their political views,” he said. “I think it’s outrageous, I think it’s a joke, it’s disgusting. I respect the American flag. I myself have risked my life countless times for the American flag, and I don’t understand or agree with this kind of behavior. I think it’s an outrage,” he added. Nah, son. What’s an outrage is your suit. Your hairline. Those horrible movies. Your suit.